Green tree python is a beautiful snake. It is small to be a python, it is beautiful bright green (juveniles are either yellow or reddish brown), and it is often seen on photos in its favourite, coiled position with the head in the middle of the coil. It is also found in Indonesia and Papua New Guinea, but in Australia it is only found in some eastern rainforests of Cape York. It is possible to see if you go spotlighting night time, and like all pythons, it is a harmless snake. 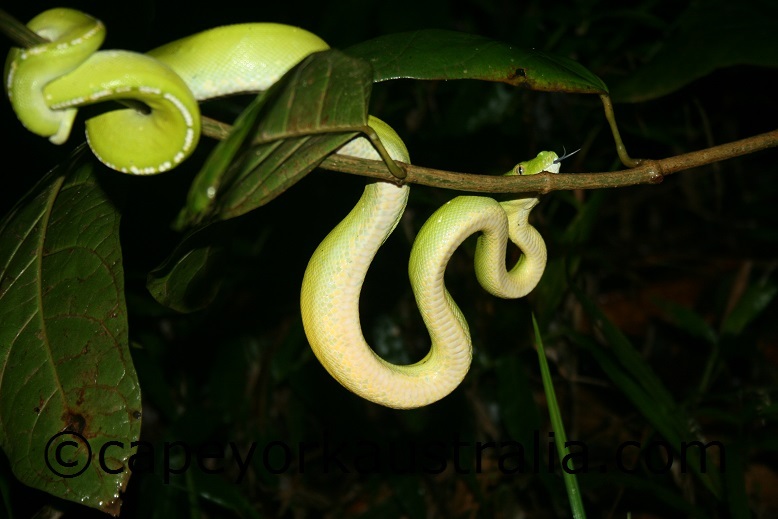 It is not the same as the (also harmless) green tree snake that is also found elsewhere in Australia and is a colubrid snake. 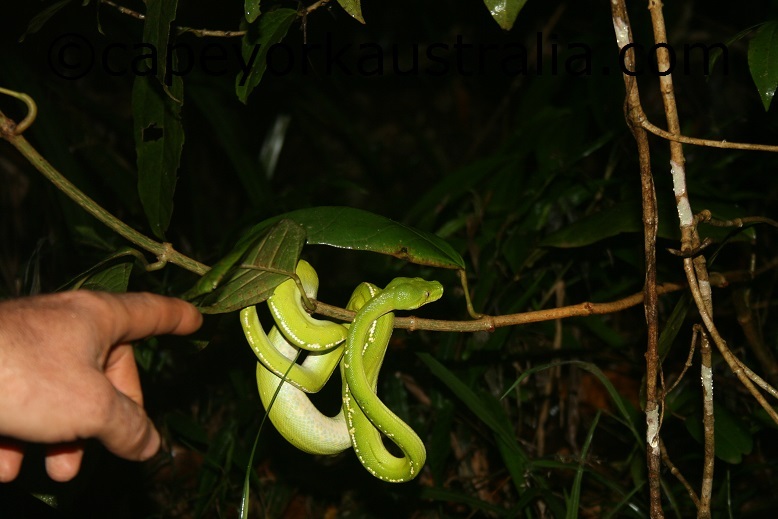 What Does a Green Tree Python Look Like? In some other countries you could mistake them for some other species, but in Australia they are unmistakeable. 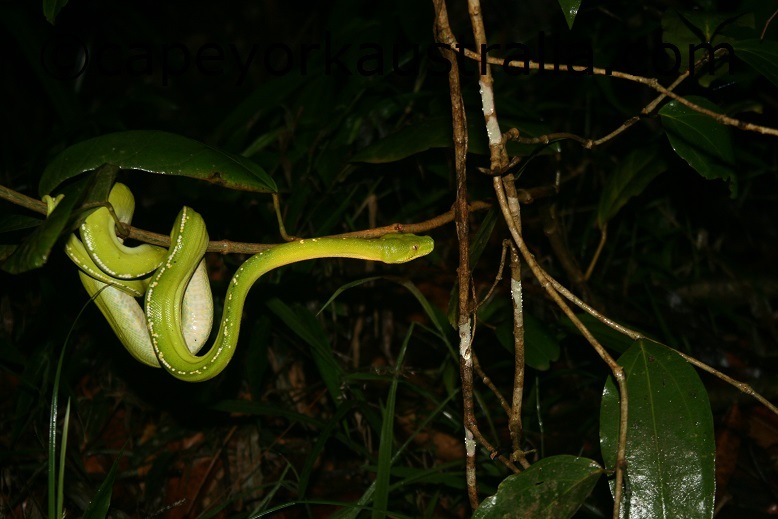 Their large head, well defined from the neck, is clearly different from the small head of a green tree snake. Their body is also very different - not as smooth and slender, and triangular in cross section. Their colour is bright green, with yellow shades, and some have white markings on the back. Juveniles are brown or yellow. They are one of the smaller pythons, usually about 1.5 metres long and weighing not more than about 1.5 kg. Their favourite resting position on top of all that - loosely coiled in a saddle, with the head in the middle - makes them impossible to mistake for any other snakes. Their primary location is Papua New Guinea (including Normanby Island and the d’Entrecasteaux Islands), but they are also found in Indonesia (Salawati, Misool, Schouten Islands, Aru Islands), and Australia. 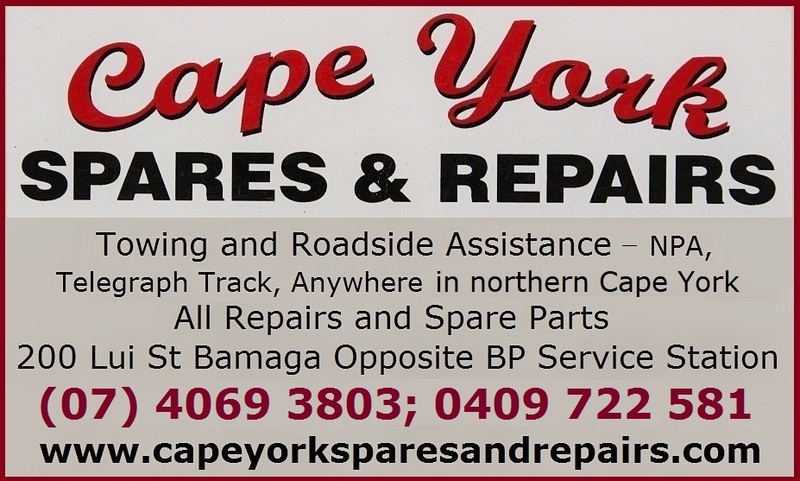 In Australia, it is endemic to some small pockets of rainforest of Cape York peninsula. Some are easier to access than the others, but your best place by far to go spotting it is Iron Range National Park. It is accessible, and the snakes are possible to spot - the best way is to go spotlighting night time, when they are actively hunting and getting around. 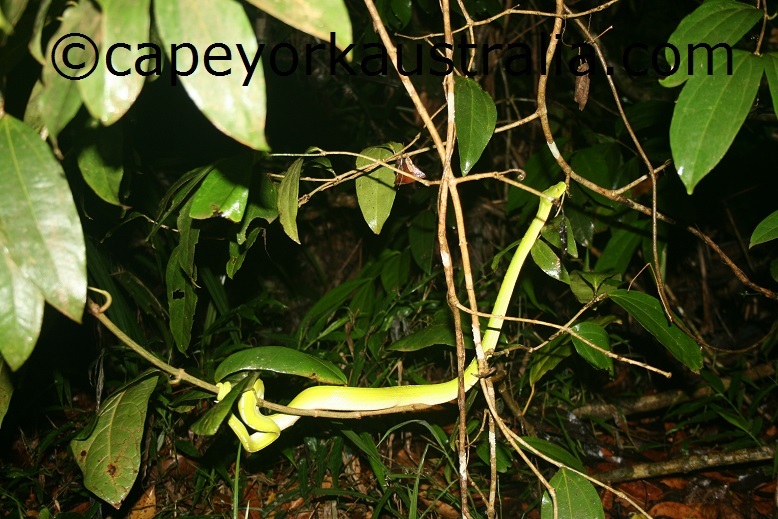 The photos on this page are of a green tree python that I saw right next to the road into the park, about a metre above the ground on shrub branches - apparently a very common height to see them. But they can also be seen in trees, where they often rest, coiled, day time. Unlike some other pythons that favour other reptiles, green tree pythons focus on small mammals, like ground dwelling mice and rats, which they catch striking from tree branches above as the unaware prey walks past them on the ground. But they do take small reptiles, and juveniles particularly like small reptiles and frogs. They were previously thought to also eat birds, but some studies have shown no evidence of birds in their stomach content. Like all pythons they are non venomous, and they kill their prey by coiling around it and suffocating it, after having caught it using their long, curved teeth. They sometimes also play the favourite trick of death adders, using the tip of their tail as a lure, mimicking a worm and attracting the prey into grabbing distance. Green tree pythons are oviparous, which means that their eggs develop outside the body of the female. Up to 25 eggs are laid in a tree hollow, then protected and incubated. The eggs hatch after about seven weeks, and hatchlings are yellow or reddish brown. Once they are about a year old, their colour changes to emerald green. The colour change is known to take about five to ten days. Their largest threat is that their habitat historically has, and in some places still is, being destroyed. If you are as fascinated about Cape York's unique animals as myself, you may like the book Life in the Cape York Rainforest . There is a whole chapter on this snake, with some great photos and interesting information. And there are also chapters on palm cockatoos and eclectus parrots, and information about other birds and animals that are unique to Cape York. It is written by a researcher of eclectus parrots. It's presented in a simple and very nice way - easy to understand for non-scientists.